I've been noticing that LeRon and I are the oldest people around. Wherever I look, there are people younger than us . . . at the mall . . . on the streets . . . at the mission office . . . at church . . . in our compound. EVERYONE is younger than us!! Where are the people our age? Are they at home (and never go anywhere?) Are they in a senior lodge? WHERE are they?! So I asked google. And google told me that the median age in Kenya is 18 and the life expectancy is 59 years! So. WE REALLY ARE OLD!!! We met a young man when we were out walking and I jumped over a mud puddle. He looked absolutely astonished. He said, "People in Kenya your age are never out jumping over mud puddles. They are home in their rocking chairs!" And he was serious. I am so grateful for our church which encourages seniors like us to go out and make a difference in the world. Yes, we are old. But . . . we have a lifetime of experience and hopefully a little bit of wisdom. And we are here on this mission trying to spread the bright light of the gospel of Jesus Christ. Today in the opening prayer at sacrament meeting, a good black brother prayed for peace in Kenya and for surrounding nations who are so troubled by war. It was a beautiful petition to the Lord to bless his sons and daughters here in Kenya. In our CTR (Choose the Right) Primary class, we talked about the war in heaven and how it wasn't a war with guns and bombs (and machetes and knives, one of the little girls put in), it was a war of words: Satan trying to get the people on his side and Jesus sweetly and lovingly encouraging us to "Choose the Right." Getting back to the issue of age . . . we helped celebrate Elder Arudo's 28th birthday! See the pictures below. Today, August 5th, is Elder Arudo's birthday (on left). Elder Arudo and Elder Wafula have discovered my blog. Here they are reading it while they munch on birthday popcorn. We brought some microwave popcorn to help celebrate the birthday. Here's the birthday boy, Elder Arudo, with his bowl of popcorn. The Torries traditionally eat popcorn on Sunday evenings. So we thought we would share this tradition with Elder Arudo. So fun to work with these amazing missionaries. On Saturday, the power was off in the whole country for about 12 hours. So LeRon and I went to Tamambo's for lunch. Tamambo's is on the Karen Blixen estate here in the Karen district of Nairobi. It is a lovely restaurant in a very beautiful setting. Eric (on left) is a local artist who sells his wares at the restaurant. Oh oh. Elder Torrie is on the lookout for more paintings! It was a cool day. I was glad I wore the wool sweater that I bought here. Hot soup and hot chocolate warmed us up. LeRon was very taken with the bottom painting. Click on the picture to enlarge it. Very interesting collage of zebras. And I was taken with the tree in the background. It is a "Brugmansia Candida" also known as a trumpet tree. Very striking. Here's a close-up of the trumpet tree's flower. The flowers hang down like trumpets. So lovely. I didn't take this picture, but I saw this beautiful bird right outside my window. It was just sitting on the clothesline with its long chestnut-colored tail hanging down. Gorgeous! I was so glad I had bought a bird book of "Birds of East Africa." 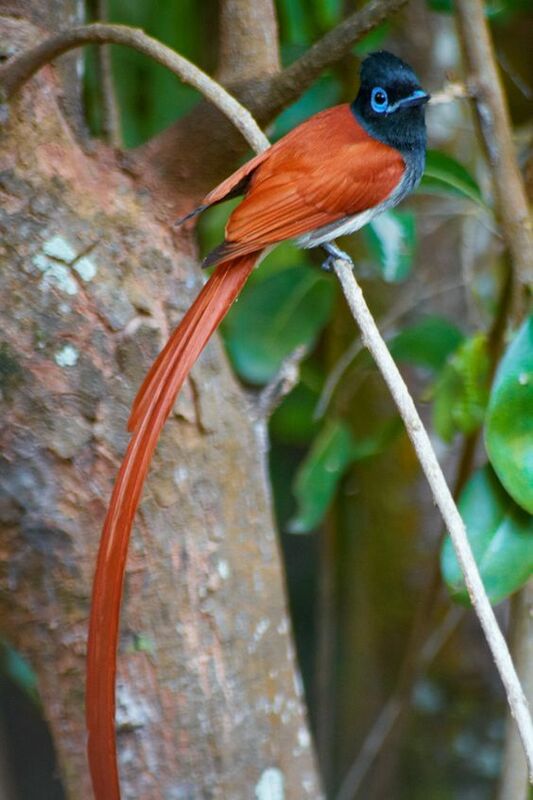 I discovered that the bird is an "African Paradise Flycatcher." How cool is that? Today coming home from Rongai, we also saw baboons playing by the road and several huge ugly looking warthogs. I know baboons and warthogs are dangerous and yet there they were just beside the road with pedestrians walking along and they were totally ignoring each other. This is definitely a wild and interesting country!!! Thanks for your post, old lady! You are still young compared to the really old old people over here, right?! I live in a ward with lots of 80+ year olds, so that keeps me feeling young. Plus, going to Primary every week! I agree with LeRon about the painting of the zebras. And you are right about the gorgeous tree! Love you guys!